This delicious recipe was given to me by my mother-in-law. I consider myself lucky to get amazing recipes passed down to me from both sides of the family! Matt considers himself pretty lucky, too. Typically we make it for a Christmas cookie. However sometimes life gets too busy and you buy enough for two batches, but only have enough time to make one. Then the second batch magically turns into a Valentine's Day cookie! With the red cherries and pretty pink insides, they definitely work for either holiday! 2. In a large mixing bowl, beat butter and sugar until fluffy. Add eggs and beat well. 3. Stir in milk and vanilla. 4. Mix flour, baking powder, and salt. Stir flour mixture and 2 2/3c. cornflakes into butter mixture. Mix well. 5. Stir in nuts* and chopped cherries. 6. Shape by teaspoonfuls into balls. 7. Roll balls in remaining 2c. cornflakes. Place on greased cookie sheets and top each cookie with a quartered cherry. 8. Bake 12-14 minutes or until lightly browned. *If you are going nut free like I did, it basically equates to a box of crushed cornflakes. These are perfect for Valentine's Day and look delicious! I'm pinning this so I can make later! i have not had these in years!! and now i want them!!! cute for v-day! Omgsh I think my gma used to make something similar!! Yum! I've just found your blog and I think it's really inspiring, it will be an honor for me if you can visit mine too, and if you want to follow, it will be a pleasure to follow you back! :) <3! They sell this type of cookie a lot in Albania, I did not know what they were called. This is a family favorite of ours as well! In fact, when Alayna was about Claire's age, she would just eat the cherries off the top! A favorite memory! 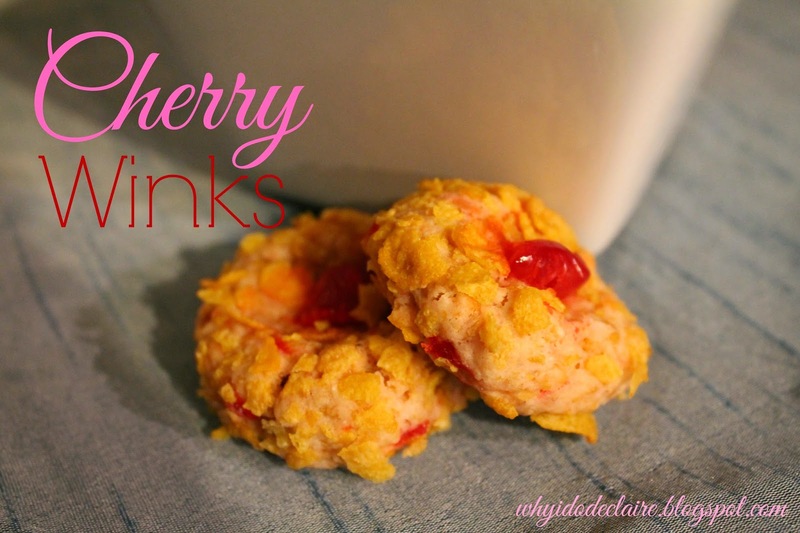 My husband loves anything with cherries in it, so I am sure he'd love this treat! With the red cherry in the middle, it'd be perfect for V-Day, too, not just Christmas!